Brutal Tales of Chivalry (Showa zankyo-den, or "Showa Era Resilience," 1965) is a Toei yakuza film choking with genre stars: Ken Takakura, Hiroki Matsuzaka, Tatsuo Umemiya, and Ryo Ikebe among them. It's emblematic of the ninkyo eiga sub-genre, pictures that romanticized yakuza codes of chivalry and honor, much as Francis Coppola's The Godfather did with the American gangster film soon after. 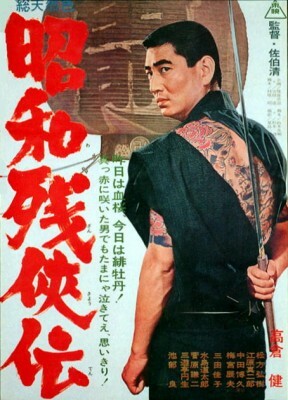 The ninkyo eiga peaked during the 1960s before being supplanted overnight in 1973 by the jitsuroku eiga sub-genre, fact-based yakuza films that cynically exposed the hypocrisy of self-serving gang leaders who used the traditions and formality of the old yakuza codes to manipulate their own soldiers. Bearing this in mind, Brutal Tales of Chivalry is mainly interesting as a movie that completely contrasts Kinji Fukasaku's Battles without Honor and Humanity (1973), the seminal yakuza film, and which kicked off the jitsoroku eiga phenomenon. Star Ken Takakura plays virtually the same character in both movies, yet their approaches couldn't be more different. Brutal Tales, like Battles, was a huge hit in Japan, prompting eight sequels through 1972. The story takes place during the chaotic months after Japan's defeat at the end of the war, in the Asakusa neighborhood of Tokyo. The city lay in ruins - the art direction is excellent in evocatively depicting this - and the undernourished rely on tekiya, street vendors, for food and other necessities. The elderly oyabun, leader of the Kozu-gumi yakuza family, is having trouble getting enough wholesale goods to his neighborhood's vendors, partly because of an intimidating, interfering rival gang, the Shinsei-kai. They want to absorb the older, more traditional gang and openly sell stolen goods on the black market. The defiant old man is fatally shot by a Shinsei-kai assassin, but before expiring he names loyal lieutenant Seiji Terajima (Ken Takakura) as his successor, leaving strict orders that he's not to use violence against the Shinsei-kai. Seiji returns home and resolves to follow his old oyabun's instructions, though everyone aches to retaliate. Being an emblematic ninkyo eiga, he also finds that his True Love, Aya (Yoshiko Mita), has for political reasons been married off to an influential associate (Shinjiro Ehara). Further, as often happens in these films, a mysterious, reticent yakuza from nearby Utsonomiya, Kazama (Ryo Ikebe), is staying there, looking for his wayward younger sister. He mostly approvingly observes Seiji's loyalty to his dead boss, despite the escalation and severity of violent attacks by the Shinsei-kai against the Kozu-gumi. Like Hollywood movies about gangsters trying to go "legit," the premise of Brutal Tales strains credibility. It's hard to read between the lines, but the movie certainly seems to suggest that the Kozu-gumi is almost saintly toward the citizens of its turf, and in a very Japanese way unimaginable in a Hollywood movie, they're less interested in making money than rebuilding the old neighborhood for the betterment of the community and the sake of Japan generally, envisioning a grand covered marketplace for their beloved Asakusa. Movies then like Brutal Tales make a fascinating contrast with Fukasaku's Battles without Honor and Humanity, in which that film's boss feels no sense of loyalty or obligation toward his underlings or the neighborhood he rules. He's only interested in amassing personal wealth and power, and uses the yakuza code his soldiers naively abide by to manipulate them into cutting off pinkies and serving long prison sentences to cover up crimes he orders. In both Brutal Tales and Battles Ken Takakura plays essentially the same character, the loyal soldier ready to fall on his sword. In the earlier film, audiences perceived this as a profoundly admirable sacrifice, while in the latter film it's exposed as foolhardy and utterly pointless. Filmed in 2.35:1 anamorphic Toeiscope with original prints by Fujicolor, Twilight Time's release of Brutal Tales of Chivalry generally looks good while falling short of greatness, as if an older HD transfer or maybe the original camera negative wasn't accessible. The image displays reasonable sharpness and decent color, just not on the level of the best Japanese ‘scope presentations from the middle 1960s that this reviewer has seen. The 1.0 DTS-HD Master Audio in Japanese with English subtitles, is a bit tinny and required some manipulation of volume, with the dialogue mixed a little low and the music and sound effects track occasionally blasting with noise. Region "A" encoded, this title is a limited edition of 3,000 units. The primary supplement is a short featurette, "Brutal Tales of Filmmaking," an interview with Toei producer Toru Yoshida, who discusses Toei's move into ninkyo eiga. It's very well made and enlightening. Also included are Julie Kirgo's usual liner notes. A landmark of ‘60s Japanese popular cinema, Brutal Tales of Chivalry is Highly Recommended.